Flat Grass Headstones and Grave Markers: Single or Companion are the simplest and least expensive of all memorials. Usually flat markers are rectangle in shape. 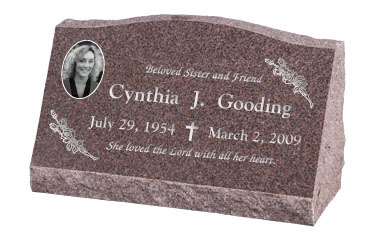 Unique memorials can be created by choosing special cut designs. Most cemeteries regulate the size and sometimes the color or design engraved on the marker. Cemeteries that have exclusive flat markers section will require a flat marker for those.